We all have our own unique calling in life. The Japanese call this ikigai—our ‘reason for being’. Canon Master photographer, Richard I’Anson, has been relentlessly pursuing his ikigai, travel photography, for over 35 years. And now he wants to help you find yours. 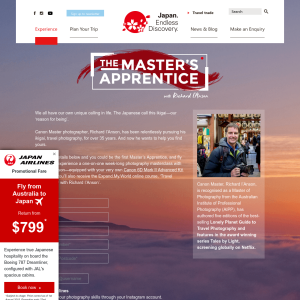 Enter your details below and you could be the first Master’s Apprentice, and fly to Japan to experience a one-on-one week-long photography masterclass with Richard I’Anson—equipped with your very own Canon 6D Mark II Advanced Kit. In addition, you’ll also receive the Expand.My.World online course, ‘Travel Photography with Richard I’Anson’. 4. The promotion is only open to Eligible Entrants. d. Aged 18 years or over. 6. All relevant instructions on the Promoter’s website (if any) form part of these conditions. address, phone number, postcode and Instagram handle. they have read and agree to the Promotion Terms. contact details to contact them if they are the winner. agrees that the Promoter will own copyright. 13. There will only be one (1) x Major Prize winner and ten (10) x runners up. 14. The Major Prize winner will be announced on the 25th September 2018. 15. The runners up will be announced the 10th October 2018. 16. This is a game of skill. AEST or before this date if the juror has finalised his verdict. licence) will be required to verify the winner is an Eligible Entrant. Dowling St, Surry Hills, NSW 2010. The new winner will be notified via email and phone. and cannot be altered in any way and cannot be taken in parts. promotional and marketing purposes. Entrants may unsubscribe at any time. or cause to be published the winner's names and suburb in any media. Tourism Organization, Japan Airlines or Canon have no obligation to use such photos. described at the time of collection. Instagram feed, based on their Creativity & Originality. assess if the candidate will be suitable for the trip. flying Japan Airlines = ?AUD $2,774 as at Tuesday 17th July 2018 (including taxes). insurance must be paid for by the winner. any written directions from a regulatory authority. $2,774 as at Thursday 12th July 2018 (including taxes). 44. Flight is valid for permanent residents of Australia only. Representative within 5 days of claiming the Prize. 48. Winner must depart from Sydney or Melbourne and return to Sydney or Melbourne. 50. a. It is the winner’s responsibility to carry a valid passport and appropriate visas required. b. Australian passport holders do not require a visa to travel to Japan. 51. Japan Airline flights are subject to availability and confirmation by Japan Airlines. costs for any additional days booked. 56. Prize and all elements are subject to availability, and once booked cannot be amended. 58. A credit card imprint maybe required at the hotel at the time of check in. 59. The total Prize cannot be redeemed for cash or similar monetary instruments.